It’s the most wonderful time of the year! And perhaps the craftiest time of the year, if you enjoy holiday projects! 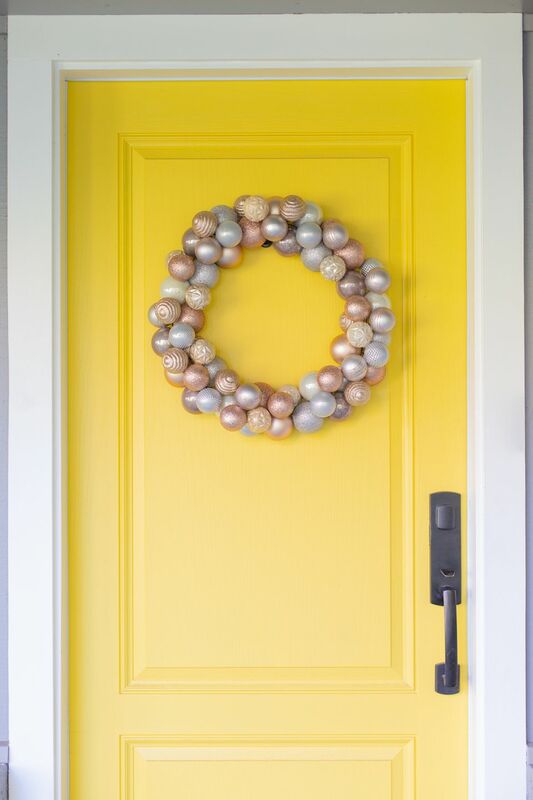 This quick and easy Christmas wreath is the perfect place to start decking your halls (or your front door). You just need a few simple materials and it comes together quickly, so you can hang your creation in no time at all. We also love that you can customize this wreath to look great with your existing holiday decor, no matter what you have. It looks great hanging on a door, on a wall, over a mantel, or just about anywhere! As you’re choosing your ornaments to create the wreath, you’ll most likely want to choose the shatterproof kind, which are made of a plastic material that still resemble the look of standard glass ornaments. It will make your wreath much more durable and you won’t have to be concerned about breakage. 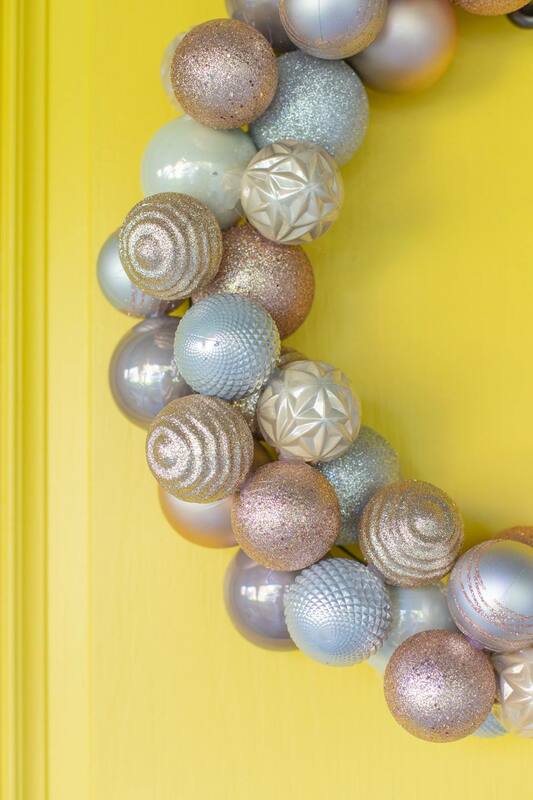 Start by hot glueing your first ornament onto the wreath form. For this first ornament, find a joint on the wreath form where a few wires come together. Place lines of glue on the top of the wires and quickly place the ornament on over the glue. Hold in place until set. We recommend using larger ornaments for this base layer. Continue glueing in the same manner, beginning to make clusters with your ornaments. You may want to remove the ornament hangers from each ornament as you glue them on; this is up to your preference, but it might create more space for you to place your ornaments. We also recommend placing the ornaments on the wreath with the hanger side hidden, so that the smooth, round part of all the balls is what is displayed on the front of the wreath. Keep glueing your ornaments to the wire wreath form. As you glue on your ornaments, begin not only glueing them to the form, but also to each other. The more points of contact that are glued together, the sturdier your wreath will be. It’s best to try to glue an ornament to the wire and at least two additional points on other ornaments. Complete coverage of your wire form with larger ornaments until you’ve reached the point where you started. Use the same technique to add another layer of smaller ornaments over your first layer of large ornaments. You’ll be mainly glueing the ornaments to each other for this layer, because the wire wreath form should be mostly covered. As you are adding ornaments, take care to hide any wire that is showing with the smaller ornaments. You may need to nestle them into each other to get good coverage. Continue this layer until all wire is hidden. Hang your wreath on a sturdy hook. After it’s hung, step back and ensure that the wires are hidden from all angles. You may need to take it down and adjust. Once you’re happy with the coverage, hang it back up and enjoy it all holiday season!